Quad core phones are fast replacing there dual core counterpart. 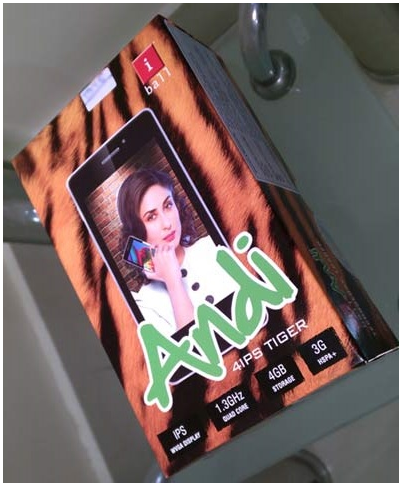 Latest in line is iBall Andi 4IPS Tiger, powered by MT6582 quad core chipset and priced for only 6,500 INR. When seen in light of phones like Moto E, Micromax Unite 2 and Lava Iris 406Q, Andi 4IPS Tiger loses some of its shine. The display is 4 inches in size and bears 480 x 800 pixels which amounts to decent enough 233 pixels per inches. The software is not new and fancy Android Kitkat like Unite 2 or Moto E, but slightly dated Android 4.2 jelly bean. The RAM capacity is also 512 MB RAM which is less than what latest competition is offering at about the same price, and will be a limiting factor. Internal storage is standard 4 GB and can be further extended to 32 GB using MicroSD support. Imaging hardware includes a 5 MP camera at the rear and also a front camera for video recording. The battery capacity is only 1300 mAh and this might be a deal breaker. Connectivity features include 3G (HSPA+ 21Mbps), 2G (EDGE / GPRS), Wi-Fi (b/g/n), Bluetooth 4.0 and GPS with A-GPS support. Upto couple of weeks back, The specs would have been impressive at this price range, but with the presence of seemingly better options like Moto E, Micromax Unite 2 and Lava Iris 406Q for about the same price range, iBall Andi 4IPSTiger is in tough waters.